Relive the magic of all eight films! This composite medley represents each of the exciting film scores. 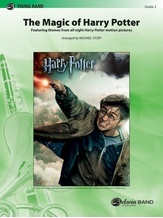 The themes included are "Hedwig's Theme" and "Nimbus 2000" from Harry Potter and the Sorcerer's Stone, "Fawkes the Phoenix" from Harry Potter and the Chamber of Secrets, "Double Trouble" from Harry Potter and the Prisoner of Azkaban, "Hogwarts' Hymn" from Harry Potter and the Goblet of Fire, "Dumbledore's Army" from Harry Potter and the Order of the Phoenix, "Harry and Hermione" from Harry Potter and the Half-Blood Prince, "Ministry of Magic" from Harry Potter and the Deathly Hallows, Part 1, "Showdown" from Harry Potter and the Deathly Hallows, Part 2, and "Leaving Hogwarts," which appeared at the end of both the first and last movies. Charismatically scored and arranged by Michael Story, featuring a variety of solo/soli segments to feature your best players and provide ample rests, this medley will ensure that Harry's conjuring enchantment lives on for generations to come. (6:00) This title is available in SmartMusic.